My husband Tyler and I had been dreaming of a trip to Japan for quite some time, but we never could have planned the way that our journey developed. Our entire trip across Japan was an amazing adventure, but our most exciting highlights and culinary discoveries took place on our 4-day trip to the rugged volcanic island of Izu Oshima. 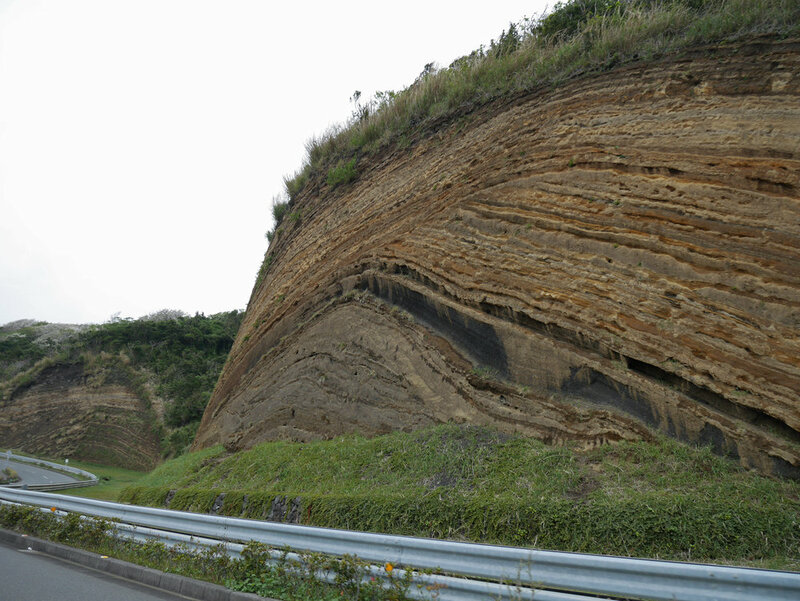 Oshima is the northernmost island of Izu Shotou – a small group of stratovolcanoes that form the eastern limits of Japanese territory in the Pacific. 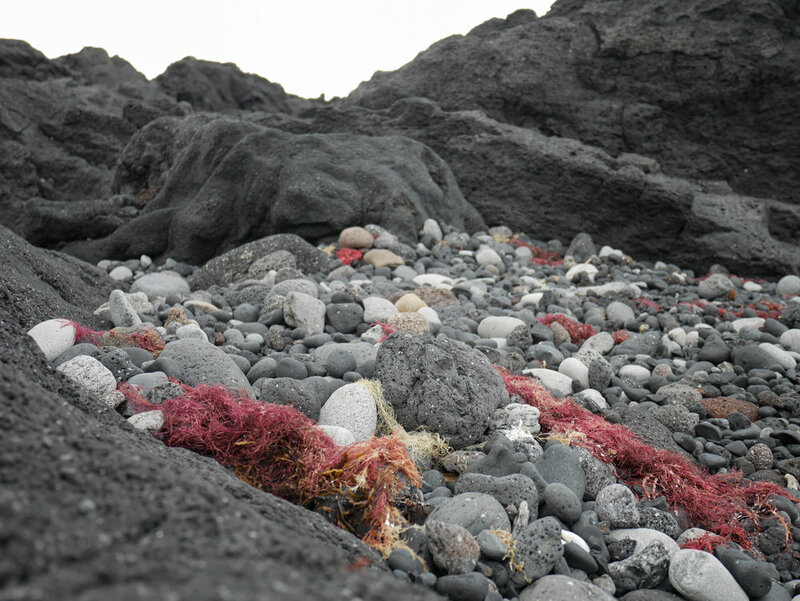 Oshima is the first in a group of small volcanic islands located around 100km south of Tokyo. As such, it isn’t usually the first destination that comes to mind when designing a trip to Japan. To begin with, most of people outside Japan have never heard of this island in the first place. 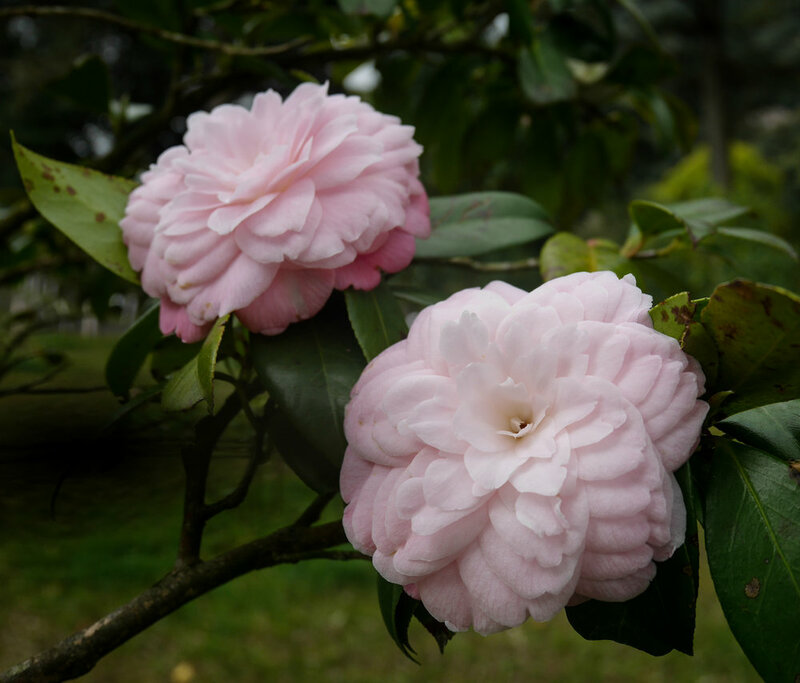 I later found out that many Japanese people only know it for their large production of Camellia oil and in passing as the island where the movie “Ringu” took place, or where the Japanese military imprisoned Godzilla. This certainly wasn't Tyler’s first trip to Oshima; eight years ago he used to live on the island where he taught English at the island’s two high schools. We met in America just after he returned from his two-year long adventure on the tiny island. Throughout our years together he told me so many stories that I was hungry to experience all the things he described about this mystical island – it seemed packed full of black-sand beaches, steep cliffs, volcanic landscapes, mystical shrines, and local traditions. Even more, I was ready to dive into a foodie’s paradise and explore all the amazing culinary secrets that this island is keeping tucked away from masses of tourist crowds of Kyoto and Tokyo. As avid travelers we are always guided by culinary discoveries so our four-day long stay on the island was packed with food experiences where we visited farmers, fisherman, chefs, artisans, and many families with whom we either learned how to prepare their traditional dishes or just enjoyed the delicious feasts they prepared for us. We balanced all this eating with hiking, exploring the island, and soaking in Izu-Oshima’s natural baths (onsens). After a two hour-long ride on Tokai Kisen’s high-speed jet foil, we arrived at Okata Port – the island’s northern pier, where Tyler’s old friend Chubei was excitedly waiting for us. “What would you like to eat for lunch?” was the first question after we gave each other big hugs. Hungry for a really good and fresh fish we immediately told him that we would love to visit a good sushi restaurant. Chubei’s eyes immediately turned wide with excitement because he knew immediately where to take us; to Minatozushi, a restaurant located in the south of the island in the tiny ancient harbor of Habu. Also known to locals as Habuminato, Habu is a small fishing harbor that used to be a crater lake. In 1703 a massive tsunami struck the island, blasting the landscape into submission and permanently joining the lake to the sea. This used to be an important port used by thousands of fishermen, but now only a handful remain. These days most of the island’s seafaring traffic is takes place at the north harbors of Okata and Motomachi. When we visited Habu there were almost no people there. The only people we encountered were a small group of students from Oshima’s International Maritime Academy who were practicing sailing. The friendly uniformed students bowed and greeted us excitedly. Getting more and more hungry we were really excited to reach the restaurant. We walked into a quiet, narrow little street with old homes and shops built with charred cedar (traditional Japanese method of preserving wood). Streets and buildings appeared abandoned at first sight. Than all the sudden Chubei stopped in front of a paper and wood sliding door and I noticed a small sign with Japanese calligraphy. We carefully slid the door open and entered into this small, Japanese-style decorated room with large shoji doors and tatami mats on the floor. The feel of this place was very warm and comforting and we immediately felt welcomed when the sushi chef greeted us from behind the sushi counter. The restaurant was almost full which was really surprising considering that there was no people outside on the streets. We sat down on tatami mats around a low, wooden table and looked at their menu. The menu was filled with pictures of fish and heavily styled Japanese descriptions in calligraphy. I had never seen a menu so intricately designed. The variety of fish was astounding. We ordered their signature dish, which is a nigiri platter on which chef prepared nine pieces of local catch – he has made a selection of fish available from the sea around Oshima and neighboring islands. On top of that we also ordered a variety of sushi and sashimi, all very fresh - texture of fish was pleasantly firm but as soon as I put it in my mouth it melted like butter and in combination with soy sauce and a touch of wasabi reached an incredible umami experience. The platters were not only a satisfaction for our bellies but also a feast for the eyes; pieces of sushi and sashimi were all meticulously assembled and artistically decorated following traditional zen aesthetics. The downfall of enjoying such a high quality sushi is that all later sushi experiences have to reach this standard, otherwise the disappointment is almsot inevitable. At first we ordered soothing green tea but we soon switched to drinking shouchu (a Japanese distilled spirit usually made from barley, rice, sweet potatoes, or buckwheat) which relaxed us and hit a spot after a long journey. Chubei related a tale about how the sushi chef in Minatozushi was so dedicated to his trade that when the massive typhoons hit that devastated the island, triggering mudslides that killed almost one hundred people, the chef refused to evacuate, as he was in the middle of preparing his sushi for the day. Our bellies were so full from Minatozushi that we didn’t get a chance to try Bekkozushi there. We decided to try Izu Oshima’s very own specialty sushi some other day. Bekkozushi is a special kind of sushi where the fish is marinated in locally grown chili pepper and soy sauce. This is an old style of preparing sushi, initially used to preserve the fish. This marinade turns fish to an almost amber color which, according to locals, resembles a “bekko,” or turtle shell. We saved this treat for the last day and tried Bekkozushi for lunch just before leaving from the port. The bekkozushi was definitely worth a try. The combination of soy sauce and chili peppers gave the amber morsels an almost translucent appearance. The texture of the fish was firm but because of soy sauce incredibly smooth and the flavors delicate. The soy sauce didn't overwhelm the flavors of the fish, instead gave the fish a subtle and pleasant sweet-sour quality. One can enjoy Bekko sushi at many places around the island, however our experience at was fantastic and I highly recommend visiting this place. Almost every dish on Izu Oshima is served with a side of ashitaba. This green, highly nutritious plant grows all over the island and is a staple food for the locals. Because of its incredible self-regenerative properties, ashitaba literally translates to “tomorrow’s leaf” - if you pick up a leaf or a stem today, tomorrow morning there will be a new leaf coming out of the same spot. Incredible! Being obsessed with everything green and healing you can believe I fell in love with this peculiar plant the very moment I tasted it. Its slightly bitter flavor is comforting, and when tossed with soy sauce, sesame seeds and bonito fish flakes, the umami flavors takes over your senses. Locals on the island are preparing and consuming ashitaba in many different ways - as a cold salad, warm stir-fry dish served with rice, tempura and tea. As we visited people’s homes and local restaurants we got an opportunity to taste several varieties of this special plant. We also learned that ashitaba is often enjoyed as a tea or dry and ground into a powder so it can be added to smoothies or sprinkled on top of dishes. Because of its incredible healing properties, ashitaba is also known as “longevity herb” and is becoming increasingly known around the world as a superfood. Its antiviral properties are so potent that it has even been studied extensively as a way to cure retroviruses like HIV. Tyler and I ate so much ashitaba in only a few days that we probably reached our “superfood quota” for a month! The least pleasant culinary experience was my encounter with another local specialty, “kusaya” (English: “smelly fish”). This salted, fermented and dried fish is definitely an acquired taste. I consider myself as an adventurous foodie, but kusaya really pushed my boundaries. One morning after a delicious breakfast, our friend Iwase took us on a tour around the island. On the way back we picked up a few groceries and also stopped at the local kusaya place. Kusaya is a dish specific to Izu Oshima, and there are only three places left where this specialty is crafted. The tradition of making kusaya started during the Edo period when people on the island were producing salt and using it to preserve the fish so that they could pay their taxes with it in lieu of rice. After washing and salting, the fish (usually mackerel and flying fish) is put into a deep hole in the ground where it is soaked in a brine for 8-10 hours. This salty, sticky brine that is left over after soaking the fish is literally the same brine as was used 300 years ago, and the accumulation of bacteria, salt, and fish parts have been passed from generation to generation. They opened the hole where the brine was stored, and – oh god, the smell. I almost choked to death. I tried to quickly take a few pictures of this historic local specialty and run away as fast as I could. Everyone including Tyler were laughing at me and probably couldn't wait to see my face when trying to eat this fish later for dinner. After coming out of the building there were several wooden platforms where the kusaya is laid out under the sun and wind to dry for one or two days before is ready for sale. Our host Iwase bought a big piece wrapped in several sheets of white paper. We arrived home, prepared a dinner and just after I began to enjoy abundant plates of sashimi an astringent smell filled the room. Before I realized it, grilled and warm kusaya was placed in front of me. I didn't want to offend our hosts so I decided to give it a try. My chopsticks reached for a piece and I slowly started to bring it closer to my mouth. Everyone told me that this fish taste way better than it smells so I was expecting a miracle to happen. It didn’t. It really was the worst smell I ever encountered; it was reminding me of decomposing meat of a dead animal and the taste didn’t change this experience to any degree. I had just barely swallowed the fish when intense nausea washed over me and I asked everyone if they could be so kind and remove the fish from my plate before something else happens. Whoa, what an intense experience! The smell of kusaya is so strong that it penetrates into your clothes and hair and basically overwhelms the place. Locals still love it and bring it to each other as a gift and a special treat! As a visitor you can try kusaya at almost any restaurant on the island. I love ramen. To me this dish is so special because it always offers something different in terms of the experience. Ramen can be wholesome, nourishing, filling the mouth with rich flavors and unveiling unique textural complexity. There is numerous recipes and every village and every chef adds its own twist to this comforting dish. What is even more special is the place where ramen is prepared and enjoyed. Usually the best places are small, hidden family-owned joins that you can only find when talking to the locals. If you happen to visit Izu Oshima during a cold, windy day like we did, I can’t recommend enough to visit “Chibi,” the ramen restaurant in small village of Senzu located in the north-east part of the island. This ramen restaurant used to be a to-go to place for Tyler when he used to live on the island and he wanted to take me there and introduce me to this delicious place. This tiny little restaurant is the only ramen place in this village, but it is so small and off the road that it can be really difficult to find. It is located in a small house with only two tables and a tiny kitchen from which enchanting smells of soba noodles, miso soup, and sizzling pieces of pork emanate. After a long hike on the beach and strong wind, the warm and nourishing broth hit the spot. Try the “miso chashu ramen” and get some of the tenderest pork you’ll ever try. This place is run by a kindest couple that will fill the room with their welcoming smiles. Don’t hesitate to ask them if you can take a quick look at their kitchen where all this ramen magic happens! I am sure there are myriad of more amazing spots on this island that we have yet to discover. So if you have some extra time to explore Japan and hunger for delicious food I cannot recommend enough to visit Oshima.